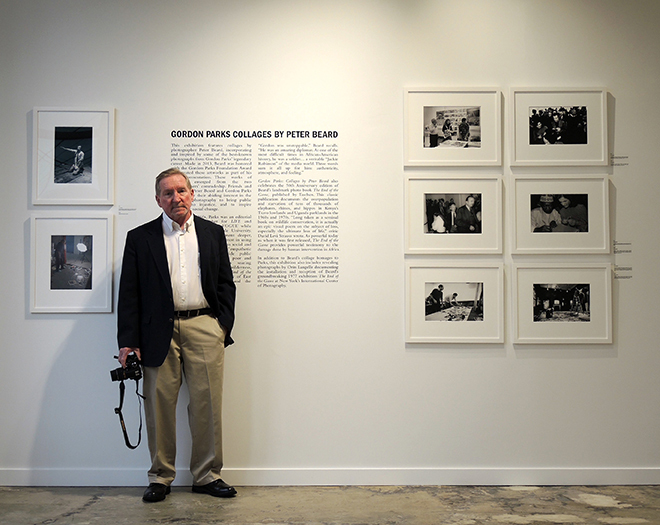 Orin Langelle by his photos (six on right and one top left) at the The Gordon Parks Foundation. Photo: Anne Petermann on 4 April 2016. 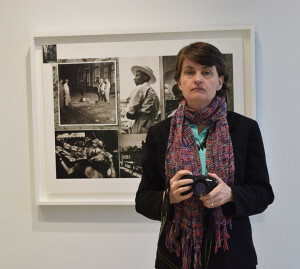 Seven photographs by Orin Langelle are included in a show, Gordon Parks: Collages by Peter Beard, at The Gordon Parks Foundation in Pleasantville, NY. Gordon Parks: Collages by Peter Beard features artwork made by Beard over the course of the long friendship between him and Parks. The exhibit is open through May 28. Global Justice Ecology Project’s Executive Director Anne Petermann in front one of Beard’s Collages. Langelle’s 1977 photos were from his show last year, The End of the Game – The Last Word from Paradise, Revisited, at the ¡Buen Vivir! Gallery for Contemporary Art in Buffalo, NY. The ¡Buen Vivir! Gallery is part of the Social Justice Media Program of Global Justice Ecology Project. With the support of the Peter Beard Studio, ¡Buen Vivir! Gallery presented last year’s show to commemorate the 50th anniversary of Beard’s book, The End of the Game available through Taschen. Langelle’s photographs at The Parks Foundation were printed by Buffalo Canvas.